It's almost quittin' time here, which means it's almost SWEAT time! I couldn't let today pass without talking about the date. The last time this will happen THIS CENTURY. 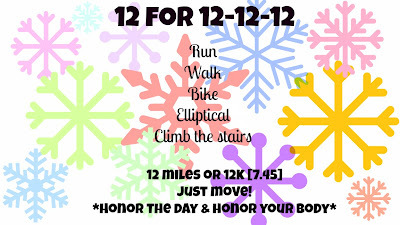 Run with Jess posted a picture this morning about picking a 12 for a challenge so I wanted to make one of my own. I can't run 12 miles or a 12k [yet] but I can do a 12k on the elliptical BEFORE hitting the yoga mat tonight. Time crunch won't allow 12 miles, otherwise that is what I would be doing. I wanted to extend this challenge to all of you! Run, walk, bike, use the elliptical or climb 12 flights of stairs. Move your body in SOME WAY to honor the day. I'll recap my workouts tomorrow morning, have a great night Sweaties! How about 12 minutes? I'm pretty sure I can do that!! !